Part of The Vietnam Collection. Scenes of a bridge and a makeshift bridge crossing a river. 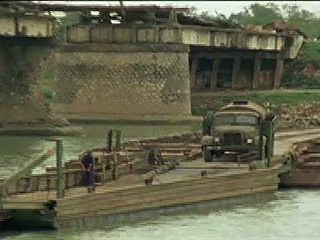 Damaged bridges south of Hanoi. Chicago: “Vietnam: A Television History; Makeshift Bridge,” 02/24/1981, WGBH Media Library & Archives, accessed April 21, 2019, http://openvault.wgbh.org/catalog/V_83C5DB07C80040F0B0D7C7F79F643B86. MLA: “Vietnam: A Television History; Makeshift Bridge.” 02/24/1981. WGBH Media Library & Archives. Web. April 21, 2019. <http://openvault.wgbh.org/catalog/V_83C5DB07C80040F0B0D7C7F79F643B86>.